2017 MCSMN Annual Conference is SOLD OUT! 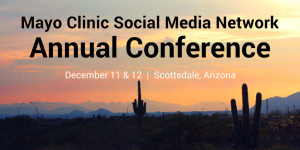 The 2017 Mayo Clinic Social Media Network (MCSMN) Annual Conference in Scottsdale, Ariz. officially reached sold out status this afternoon, four weeks in advance of the event! We capped registration at 125, excluding staff and speakers, to help ensure a highly interactive and engaging experience for our participants, with many opportunities to contribute and connect with peers. While we aren't taking new registrations for the Dec. 11-12 conference, we are starting a waiting list in the event spots become available due to cancellations. If you'd like to be added to the waiting list, send us an email. The 2017 Mayo Clinic Social Media Network (MCSMN) Annual Conference in Scottsdale, Ariz.